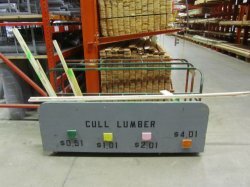 What in the world is cull lumber? You are here: Home / 2012 / October / What in the world is cull lumber? In my previous article, I made a few references to “cull lumber”. There were a few people who asked me what in the world that was, so I thought it warranted a short entry and explanation. cull/kəl/ – Verb: Select from a large quantity; obtain from a variety of sources. Most lumber yards and big box stores that carry lumber have a small section, usually a rack of some sort, where they display cull lumber. Cull lumber can be any number of things, such as off-cuts from other customers who “just need 3 feet of an 8 foot board because I can’t fit it in my Ford Focus.” (I don’t know what that guy’s problem was… I’ve successfully fit thirty, yes thirty, four foot boards of 2×4 and 2×6 mixed variety in my Mazda 3, which was easy, as well as a 7 foot oak clothes rack and shelf for a closet, which was not that easy.) In that scenario, the customer pays full price for this stick of lumber that the store has cut for them, but instead of throwing it away, the store will put it in the cull lumber pile. 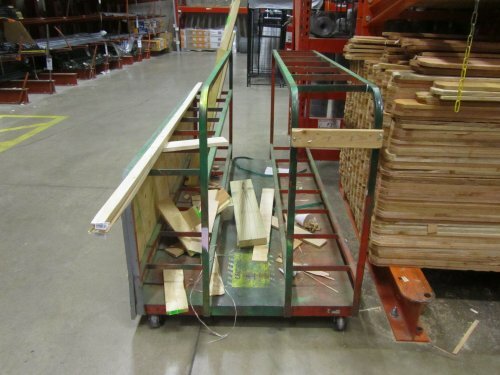 Another scenario that I often see is when a pallet of lumber is delivered, there may be several warped pieces (2×4’s and fence lumber, for instance) that are unsellable in their current warped form. This is usually due to the sawmill cutting the lumber wet, and when it dries, it does so unnaturally and unevenly to the point where it bows and bends. To partially combat this problem, some stores will cut pieces with a bow in only part of the board, and stick the resulting straight pieces in the cull lumber pile to recover some of the cost of lumber that is otherwise unsellable. These different off-cuts accumulate over time and can have many ranges in size. I’ve seen cull lumber racks that were overflowing with 2×4’s, 2×6’s, 2×8’s, PT fence poles, and many others in the same setting, usually around truck delivery day. Image: A cull lumber rack with slim pickings. So what does this have to do with you, the consumer? And why would you want to even entertain the notion of buying someones throwaways or damaged goods? Well, cost savings, of course! If you have a project that requires only small cut lumber (like my target stands) and you aren’t too picky about the fit and finish, cull lumber may be the way to go. Scenario time: You have a project that requires (4) 4 foot 2×4’s, for example. Low grade 2×4’s at my local big box are currently $2.22 a piece and are 8 feet long. If I buy two of these and cut them down, it will cost me almost $4.44, we’ll leave tax out of it for now. 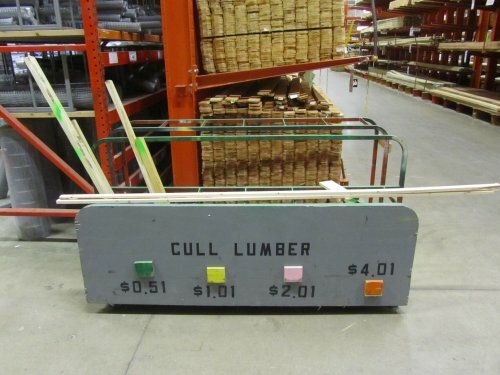 If you take into account the cull lumber prices on the rack above, anything spray painted with green on the end is 51 cents. If I’ve got four 2×4’s in the pile, I’ve just decreased my materials cost down to $2.04, realizing a reduction in cost of $2.40. For that amount of money, you can live your life in true Bacon Fat Labs style and stop at your nearest convenience store for an RC Cola, salted peanuts and Moon Pie. If you understand the significance of this combination, you are now my friend, no questions asked. But wait, we’re not done yet. I have a slightly underhanded trick that I use, sometimes it works and other times, not so much. This particular visit luck seemed to be on my side. I am notorious for showing up at my local big box store about 30 minutes to closing on Saturday night. The last time I went, I noticed the cull lumber rack was extremely full from what appeared to be an onslaught of weekend warriors in Ford Focus cars that needed 2×6’s and 2×8’s. I had a replacement 2×3 cut up to fix the damaged target stands at the last range trip. In addition, I pulled four “somewhere between 4 and 5 foot” 2×8’s and five “somewhere between 4 and 5 foot” 2×6’s from the pile, all marked at 51 cents each. This should have totaled around $4.59. I get to the checkout with my cut boards and cull lumber and the checkout lady asked me, “Do you mind if I just charge you for an extra 2×3 instead of ringing up the cull lumber?” When clerks sell cull lumber, they have to measure each individual piece they sell and document it, which is extremely time consuming. This is where checking out right before closing time is advantageous because they just want to close and go home. I indicated that this would not be a problem. NINE boards of mixed 2×6 and 2×8’s for $1.77! $2.82 in my pocket! At this point, I was rolling in the dough of my recent cost savings and decided to splurge for gas station hot dogs and a raspberry Fanta Slushie! In retrospect, I don’t recommend that combination, but I thought it was a good idea at the time. So next time you’ve got a small project where you find that using some construction grade lumber is in order, check out the cull lumber pile! You won’t be sorry. Well, you won’t be sorry if you leave out the gas station hot dogs covered in mustard and chili along with the raspberry Fanta Slushie, that is. Cheers. Excellent information. I am trying to hone my woodworking skills and build some useful items for my apartment, but money is tight. I just took apart a tv stand i picked up at a thrift shop for $5, and got about $30 of mdf wood for a great price, problem, is that it has all the pre-dilled holes, and a veneer i need to remove. It is going to require a bit of work to turn this into a shelving system, but that’s part of the point in earning experience. In the future, it would be nice to pick up some fresh wood and work with that. My next project is a workbench. I am currently using an old cat-condo thingy as my stand for measuring, marking, drilling, and sawing. I need something more substantial. I also need a table saw Jigsaws just dont cut it when you like to drink while working on projects like this. A lot of sanding and short cuts result, and make life so much more difficult. I know all too well what it’s like to have limited tools. When I was growing up, the only power tool we had was literally a jigsaw. In lieu of a table saw, in the meantime, would you be able to get by with an 8 foot straight edge and circular saw? Sometimes I will use that to rip sheet goods down, even though I have a table saw, because some of those sheets are a little unwieldy and the risk of kickback is a little too much. They sell the straightedges at all of the big box stores and if I recall, mine was around 20 bucks I think. I have never heard of cull lumber before. I’ve heard of it being called the “scrap bin” or the like at lumber retail stores, but maybe it’s a regional thing. 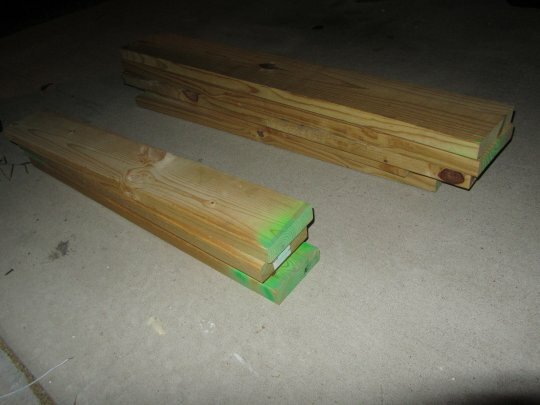 What ever it’s called, it can be a great place to find inexpensive lumber for small projects. Just make sure to check the lumber for cracks or other imperfections. This way you won’t have to compromise your project. Thanks for the post. I have also used the term from people who have mills. They are the ends of the cuts from trees with rough (bark) and uneven edges. Also, some pieces have holes or knots in them that make them a lower grade/quality. If you are willing to run them through a table saw or are working on a project that requires a smaller piece, as mentioned in the article, you can get them really cheap. I used cull boards from a local Mill for siding for a tree house. Didn’t need good boards for that.